Earlier today I wrote a preview of players I thought the Bears would consider tonight. Shortly after finishing it, I went on Twitter and joked that I had just written 2,000 words about a bunch of players that the Bears aren’t going to draft. So at least I was right about one thing. The Ego Ferguson pick came as a bit of a surprise. Once there was a run on defensive tackles before the Bears came on the clock, I assumed that they’d look to find the safety they didn’t draft yesterday, and like yesterday, I was wrong. Instead they drafted a defensive tackle who most had projected as a third round pick. Now, I get that some people might consider this a reach simply because we hadn’t heard much about Ferguson before the draft, but it’s a pick I understand despite my surprise. There are a lot of scouts who were high on Ferguson because when you watch him on film the talent is evident. 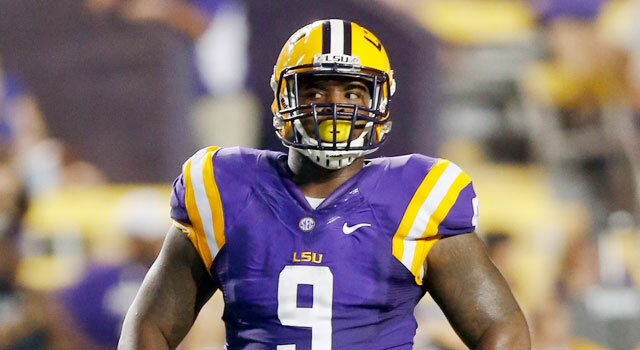 You don’t play defensive tackle at LSU if you aren’t talented. He is a bit of a project, though, which may rub some people the wrong way. He’s a good player that uses his hands well to maintain leverage, and can get side-to-side on the line of scrimmage to stop the run. Where he really needs work is as a pass-rusher. He only had one sack, three QB hurries and three tackles for loss at LSU last season, and it’s because he’s not very explosive off the ball. In other words, he’s a lot like Timmy Jernigan, though without the long track record on the college level. He may end up being just as good as Jernigan in the NFL, but he will need work. I’d expect Ferguson to get some time in the rotation at DT this season, but I wouldn’t expect him to become a starter or major contributor this season. This entry was posted in Chicago Bears and tagged Ego Ferguson, NFL Draft by Tom Fornelli. Bookmark the permalink.